Besides the beauty of the landscape in the towns located in the Valle Sagrado de los Incas (Sacred Valley of the Incas), near Cusco city, other towns are located, that also because of the importance of their archaeological locations, beauty of their fields and landscapes, are an excellent destination. We recommend the visit to the places that are described next. The living Inca village of Chinchero. 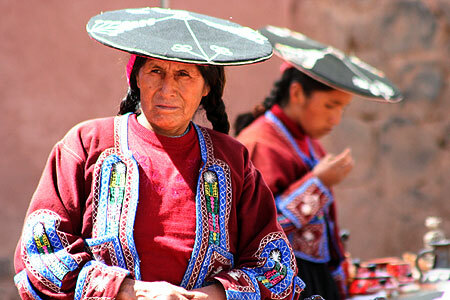 This community is located 28 Km from Cusco city on the paved road to Urubamba. Here lie the remains of what was the royal hacienda of Túpac Inca Yupanqui, as well as a beautiful colonial temple built on Inca foundations. Its main attraction, however, is its Sunday market, which was originally dedicated to the barter of products by the people of the valley and the upper areas. Nowadays, the market is a real hub of activity, vibrant with color and movement which fascinates tourists with its range of handicrafts and textiles made in true pre-Columbian style. Both men and women of the numerous communities attending the Sunday fair wear colorful and varied clothes. 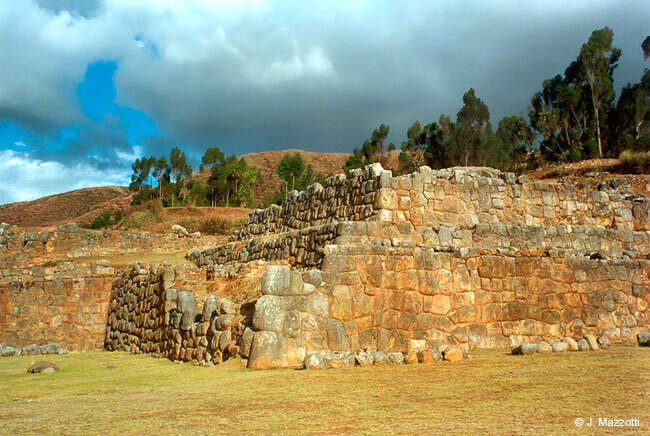 The archaeological complex of Chinchero was built at the time of Túpac Inca Yupanqui, Chinchero is a compound of squares, ramps, terraces and finely carved stone chambers. The remarkable terrace built with carved stones bordering one side of the main square will not go unheeded. 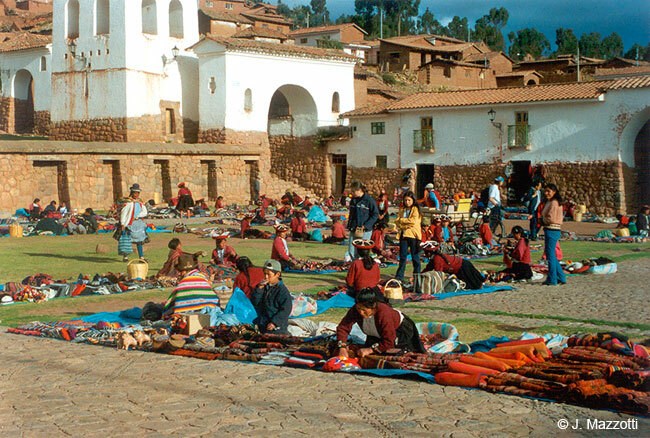 To have the village built as a place of rest and merry-making, the Inca donates houses to Cusco aristocrats and kept some houses to himself and the royal family. During Colonial times, the present Catholic church was built over what probably was a temple of the Sun. 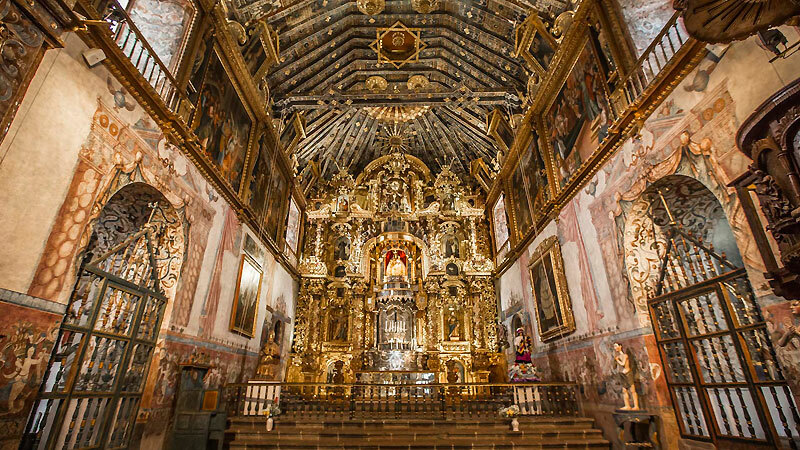 Its altar is covered with gold leaf and its walls are decorated with paintings of the Cusco school. 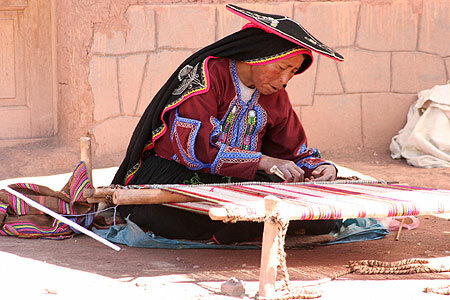 Awai Riccharichiq is the quechuan name of the Center of weavers of Chinchero and Nilda Callañaupa is its founder and current director. The site is a marvel. Around the ample garden there is a covered gallery and towards the end, a venue built of natural colored mud, roofed with tiles. The garden gathers groups of women enthralled in a task that demands the effort of their hands but also, of their memories and intelligence. They are weaving and through this activity they are revitalizing a labor that during pre-Hispanic times was one of the most valued by society. The art of textile making divided work, provided the different social classes of pieces for daily use, and also ornaments of power and wealth. The textiles synthesized and conserved a Cosmo vision, which was almost a language on its own. Today, these women, young, adult, old, continue weaving over the base of the same ancient technology and using natural fibers and dyes extracted from plants that grow wildly in the lower areas. 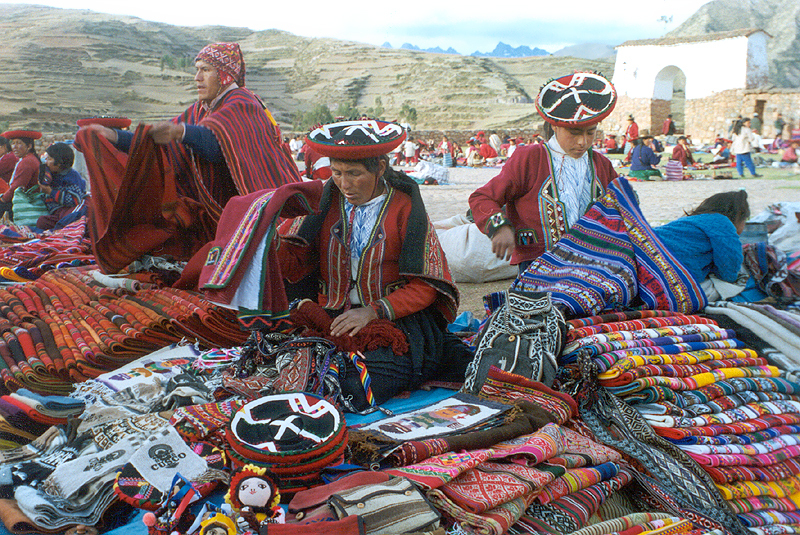 Visiting this place will generate a transformation in the traveler, as he will understand that there is an immense ancient world that is updated daily thanks to the hands of the weavers from Chinchero. The tourist corridor called Manco Capac, is the route between Cusco and Puno and comprises beautiful villages, archaeological sites, the baroque route, and beautiful Andean landscapes. This train route Cusco to Puno was awarded such as second rout most beautiful of world. 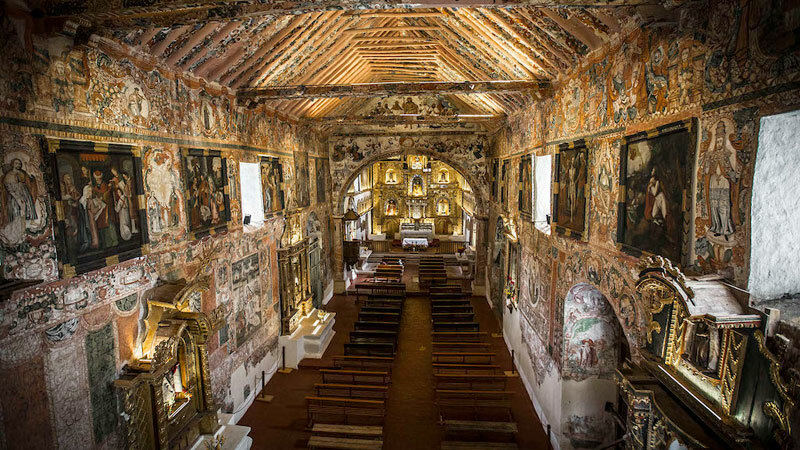 Is due to the presence of three heritage monuments of the seventeenth and eighteenth centuries, the exceptional qualities of three temples, San Pedro Apostle Andahuaylillas, San Juan Bautista Huaro, the chapel of the Virgin of Candelaria Canincunca and the Church of Society of Jesus in Cusco city. Town located at 40 Km southeast of Cusco, with a beutifull main square naturally decorated with Pisonay (Erythrina edulis) coral tree; it has a church with humble external aspect that keeps one of the most valuable jewel of the colonial art in Peru, denominated the "Capilla Sixtina del Peru" (Sistine Chapel of Peru). Andahuaylillas is one of the most beautiful colonial towns in the region, has a picturesque main square with leafy pisonay trees hanging overhead, which is surrounded by old estates. 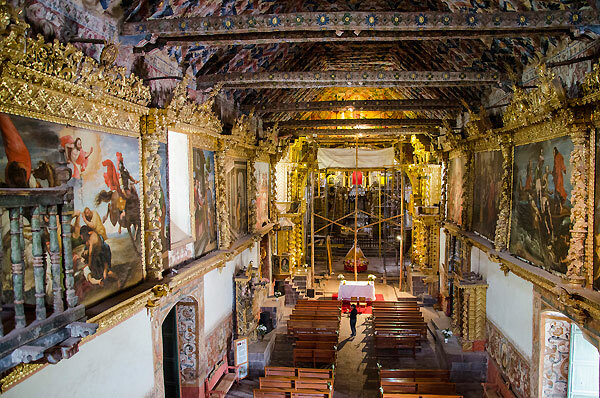 Its main attraction is its distinctive church, San Pedro de Andahuaylillas, which was built in the seventeenth century and is considered to be a World Heritage Site by UNESCO. Its interior, elaborately decorated with paintings, is simply breathtaking. 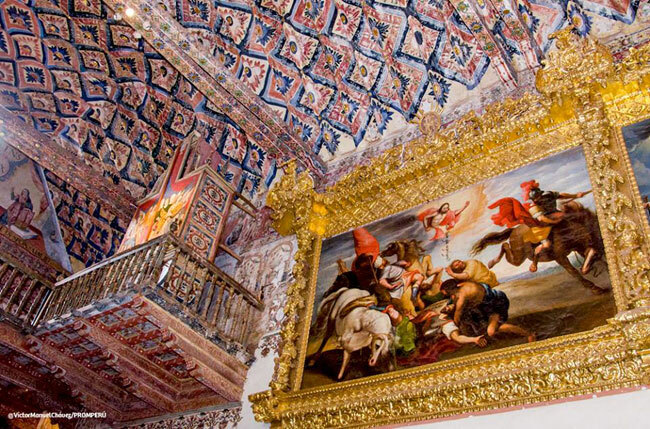 It also houses oil on canvas paintings from the Escuela Cuzqueña and Baroque altars made of carved. The restoration, funded by the World Monuments Fund and the Spanish petroleum company Repsol, it has been completed in November 2012. The Huaro village is located 4 kilometers south of Andahuaylillas. In the square of this region lies a small white church, when it is not holiday season looks deserted. Precedes a carpet of boulders that form elaborate designs on the floor. The colonial temple of Huaro, San Juan Bautista de Huaro, was possibly built from the seventeenth century and completed in the eighteenth century. Its structure consists of a conventional plant with a single nave, facade decorations classic native primitivism, españada tower roof armed sticks twofold. Once inside, stands a Renaissance altar one of the oldest in the country, but the most fascinating thing about this temple are undoubtedly the murals that flank the front door. Inside the church there is an organ, the oldest brought from Spain to America and correspond to the early sixteenth century. The chapel of Canincunca, dedicated to the Virgin of Candelaria, devotion widespread in the southern Andes, was probably built in the 1st. third of the seventeenth century. As many of them were built by the landowners, who initially had the custom of the Crown to evangelize the natives in the new belief. This function then would be in charge of religious orders. Because of its location, archaeological evidence emplacement area, give us evidence of an important pre-Hispanic site, perhaps prior to the Incas, reused by them in the fifteenth century. The actual existence of the cemetery at the back of the chapel slope tells us its link with prehispanic sacred sites, allowing construction to deduce that in that place was no accident. The cemetery could exist from the time of construction of the chapel. Currently in use and serves the surrounding settlements. One of the most interesting projects of cultural tourism in Peru is located halfway between Cusco and Puno close to the city of Sicuani. Spending some days there allows the traveler to discover a living museum, where ancient tradition maintains its validity in different forms of cultural expressions. Pottery, music, dances, gastronomy, clothing and the magnificent Inca temple dedicated to Wiracocha are part of the experience. The town of Raqchi belongs to the district of San Pedro, province of Canchis; it is located on the right margin of the Vilcanota River and it has an altitude of 3,480 m.a.s.l. (119 Km. south of Cusco - 2 hours by car). The community is composed by eighty families, who work in agriculture, pottery and recently, in cultural tourism. The villagers own small parcels of land in which they cultivate potatoes, corn, ocas, tarwi, quinoa, ullucus and wheat for self-consumption. Due to the fact that this activity did not allow them to capitalize, they advocated themselves to a genius tourism venture that is producing important results. Most raquiños have higher education: they are either teachers, tourist or computer sciences graduates. This characteristic, which strengthens self-confidence, has been determinant when giving value to their traditional resources. The cultural project is associated to a process that seeks to rescue traditional attires, pottery, food and language. The concept of Raqchi is to transform the community in a living museum where the visitor can come close to authentic aspects of the Quechua culture, by spending some days with the inhabitants. For this they have built bedrooms and bathrooms adjacent to the family homes. The town is widely known for being the setting of one of the most colorful and energetic festivals in Peru, the Feast of the Virgin of the Carmen (July 16th). A religious celebration of colonial origin, in which the excess and joy of the dances and parades give an extraordinary twist to one of the biggest demonstrations of faith in Peru. Portal to the Manu National Park. This typical colonial town in the Paucartambo valley, southeast of Cusco, is characterized by its narrow cobblestone streets, white mansions and bright blue balconies. 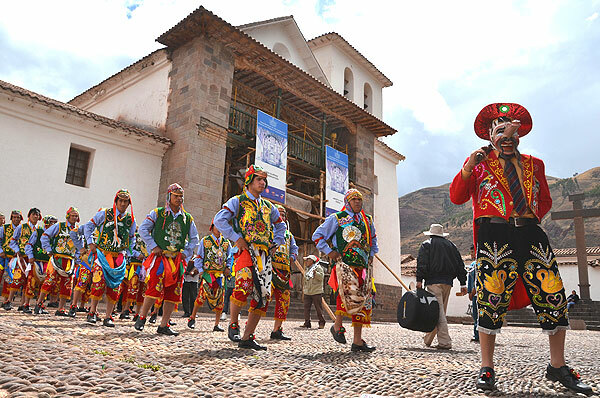 During these celebrations the habitual tranquility of this Andean town is all but forgotten in a lively display of color, music, dancing and colorful processions. Also renowned are the masks and typical costumes worn during the Catholic celebrations held in honor of the Corpus Christi. During the Inca Empire or Tahuantisuyo, Paucartambo was an important military supply center and later in the Colonial period (XVI - XIX centuries) it became an important mestizo commercial center in the southern Andes. Located at 110 Km (68 miles) east from Cusco city. From Paucartambo, a narrow rough grade road snakes up towards the Acjanaco mountain pass (3,800 m.a.s.l.) and the scenic overlook of lookout of Tres Cruces, a natural balcony facing the Amazon region. Here, one can witness an optical effect caused by the sunlight bouncing off the clouds covering the tropical forest below, making for one of the world’s most unique sunrises, the phenomenon occurs at dawn during the winter solstice (June and July). From Tres Cruces the road continues toward the deep valley of Kosñipata and the Alto Madre de Dios River, that passes through the lush cloud forests of the Manu National Park, one of the world’s most diverse paradises. Located at 109 Km (68 miles) south-east of Cusco city, take the partially paved road (3 hours by car) to the locality of Paucartambo, from here it is a further 45 Km (28 miles) to the Tres Cruces scenic viewpoint (2 hours 30 minutes in a 4x4).